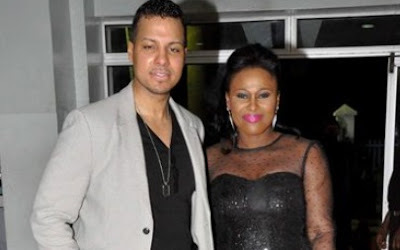 Jombo has reacted to yet viral reports that she had secretly divorced her husband, Kenney Rodriguez, who is alleged to have cheated on her with a 22-year-old American. The rumours began in July when leaked photos of Kenney in a compromising position with a young lady surfaced online. The images were allegedly taken in Kenney’s home, same one he shares with Uche whenever she visits the United States. 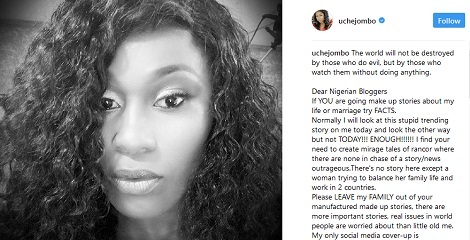 Uche however says her family is intact and she is fine with her husband and wants the world to leave them alone. What she wrote after the cut. Normally I will look at this stupid trending story on me today and look the other way but not TODAY!!! ENOUGH!!!!!! I find your need to create mirage tales of rancor where there are none in chase of a story/news outrageous.There's no story here except a woman trying to balance her family life and work in 2 countries. My only social media cover-up is pretending You "Zero journalistic ethics" people didn't hurt me by your unfounded and non factual stories.